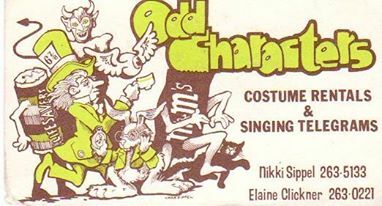 Odd Characters - "Where the Elite and the Underworld Meet"
Found this clipping in a drawer and was suddenly transported to the 80's and what a great experience it was to do those singing telegrams. I'm the one on the right. 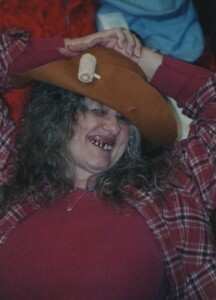 My mother made costumes and rented them to people every Halloween She did amazing work, great detail, I loved the costumes she made for me too. And that idea sat with me until 1980-something when I started a small costume rental business on my front porch. I had all these cool costumes that I had made my for my own children just hanging around and Nikki had some too. We sewed a lot the first year, taking special orders was an easy way to build up our stock. Even my mom sewed. Luck was with us. Even though the deposit we charged was small we rarely, if ever, lost a costume. Odd Characters was a huge success. Our prices were low and this was before walmart had all those sleazy disney princess etc type garb. Doing singing telegrams was a good income supplement as it was year round.Truly, we thought we'd die of fright or pee in our pants at our first one We were soo nervous. It got easier, and we had older teen kids who would sometimes do them. 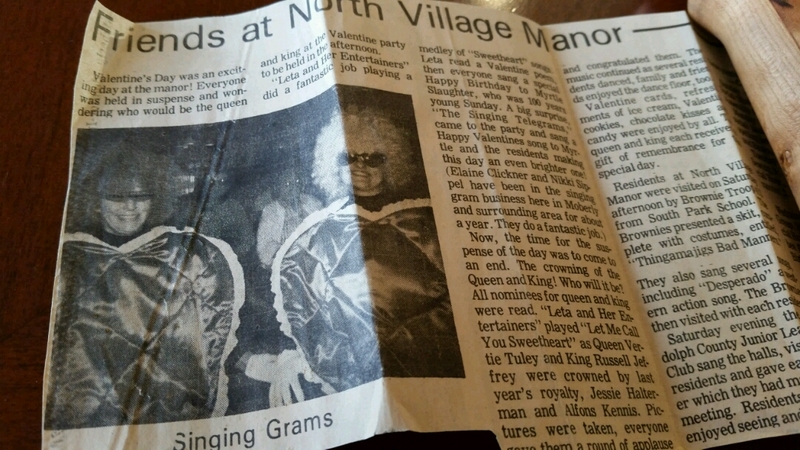 We wrote nerdy little poems that we sang to the recipients, ran Valentine specials, dressed as the hearts in the clipping. Of course, Halloween was far and away the craziest busiest most profitable time of year. As we grew we converted half of my garage into a bigger shop area, and then that was too small so we moved to town to an interesting space upstairs over an old drugstore. Inventory at closing was nearly 400 costumes and accessories. I kept some, Nikki kept some and rest we sold to this cool guy who was opening a shop called "Gotcha" in a nearby city. It's still in business so I feel like our work is still out there offering folks an opportunity to transform themselves into someone/thing else. I still wear a costume every Halloween. It's so much fun to play dress up.